Jakarta is a big city, really big. It’s metropolitan population is somewhere around 28 million ranking it about sixth in the world. Unfortunately it is also one of the largest cities in the world without a significant public transport system making its travel delays unavoidable and traffic the first topic of most small talk. The AIG was well aware of this fact in advance of our arrival and had planned accordingly, 2-3 hours commute allowed between appointments, lots of water in the backpacks etc. 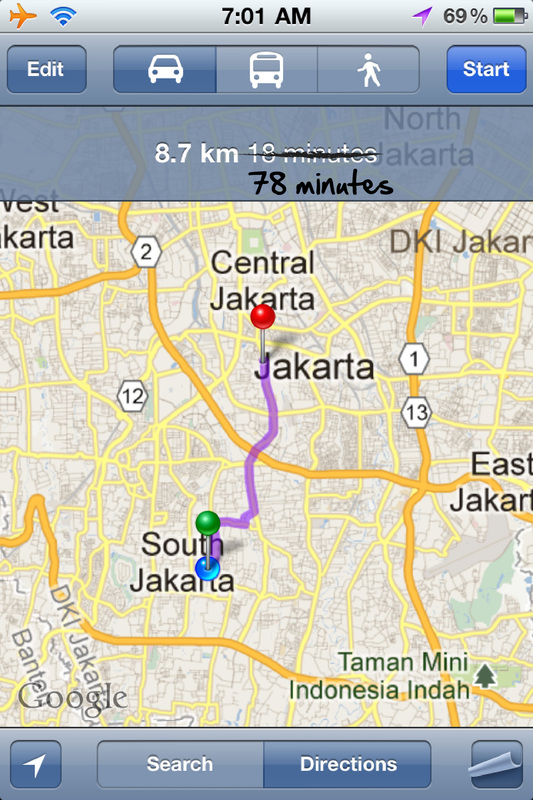 Planning and reality can differ however and the reality of what Jakarta traffic can really be like is astounding. So far we have averaged between 7-8km/hr (5 mph) in the city, and have not even hit what the locals would call a “Macet”, a word Jakartans have invented for when the word “traffic” doesn’t really cut it. This entry was posted in Transport, Travel and tagged Indonesia, Jam, Traffic, Transport. Time to get the bikes out? What’s the pollution like? The pollution is really noticeable when out in traffic. Lots of two-stroke motorcycles make for lots of fumes. Many people wear masks while on the road. Have you tried going on a scooter?